Guru Play Casino has been running in the gaming industry since 2010. The site is owned and managed by the Smart Gaming Group and is licensed under the jurisdiction of London in the United Kingdom. Guru is known to be the front of the brand named Smart Live Casino. The two brands have basically the same offerings and features. The Sky channel of a British television broadcasts the live games showed in the said gaming site. Live playoffs are available for roulette, blackjack, and baccarat. The site entices the gamers through the London cityscape as its background during the play. 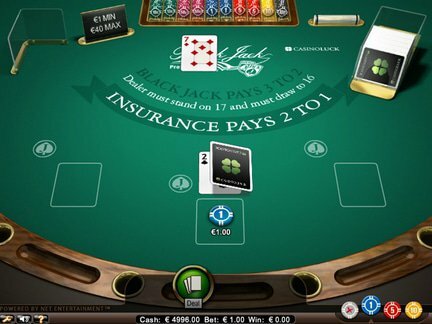 Live dealers of the company always keep their customers entertained and alive. Aside from the live tournaments, Guru also features some games from the Net Entertainment software provider. The software provider enables instant play for video slots, classic slot, single hand poker, Caribbean stud, scratch cards, and other arcade games. The said software provider is known for its high quality creations, so rest assured that the games offered in Guru are of high class as well. The poker room, on the other hand, is provided by the Ongame Software. New players in the live deals are given rewards on their first deposit. 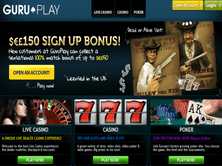 Guru Play bonus is only delivered to those who join the live casino. Make sure to check first the wagering requirement before grabbing the bonuses. Guru is known for having a high betting requirement for their promotions. It would take a longer time before a player can withdraw his winnings.